The beginning of 2019 definitely did not get off to a great start! There isn’t much of a worse sound than the ringing of your alarm at 5:00 AM after you went to bed around three earlier after a way too loud and exhausting New Year’s Eve party in Brooklyn. Even worse than that was when I looked down at my phone and saw a message from United Airlines that our flight to Mexico was cancelled and we were put on a new flight for the next day! After New York experienced a frigid downpour all New Year’s Eve there was no way I was accepting being deprived of the sun for one more day. After changing my direct flight to a new connecting one we had to rush to the airport to make it on time. Luckily we made that flight and were arrived in Cancun only a few hours later than originally planned. Unfortunately there was another setback when we got put in the slow line with only one border agent at customs and had to wait forever to get through. I was really nervous that our shuttle to the hotel wouldn’t be there because we had changed flights that very morning and we were being delayed again at customs. Incredibly, our driver from the resort was waiting just outside the door and we were finally on our way to start our vacation! About 45 minutes after we left the airport we arrived our first resort: Sandos Playacar, a beautiful and expansive all-inclusive resort just to the south of the popular resort town of Playa Del Carmen. Our room was in the adults-only section right by the beach and it was such a gorgeous and relaxing area of the resort. The first thing we did was grab a couple mojitos and relax at the resort’s incredible beach. Despite what you may think from my Instagram, I’m usually not one of those adventurous travelers; on vacation I prefer to sit on beach chair in a sun hat with mojito in hand and read a book until I fall asleep two pages in. Usually my boyfriend has to wake me up to make sure I don’t get sunburnt because I fell asleep right in the sun. So I do try to relax and get tan, but I still always end up looking so pale! Sipping on a delicious mojito at the Sandos Playacar Resort! Don’t get me wrong, there are lots of adventurous things to do in Mexico both outside and inside the resort. Sandos Resort has its own separate eco-resort where you can do amazing things like zip-lining, kayaking, and diving into cenotes (underwater caves). The part of the resort we were at had its own cool things to do like a water park, water sports, mini golf and nightly shows. We definitely took a more relaxing approach to our vacation and naturally frequented the beach, pool, and their amazing spa! They have an incredible zen spa area that is open late with soothing hot tubs. We also got an amazing massage - I am a big fan a strong massages and they will go hard on your sore muscles if you ask them to! Besides and beach and the spa, good food and drink are essential on any vacation. I had some really amazing food at Sandos Playacar, my favorites being the Festival Grand Buffet (huge selection of tasty foods) and Il Piemonte (Italian). The night we went out for Italian was the only night a mojito wasn’t my drink of choice and instead we opted for wine and it was great! A final surprise during our stay at Sandos was one evening when we returned to our hotel room from being at the beach all day. When we were about to reach our door which opens to a large interior courtyard we heard a bunch of loud howling. Across the courtyard was a troop of monkeys perched on the balcony and rails eating fruit. They even had little babies! It was so cool to see and totally unexpected, but I found out later that they show up from time to time looking for treats. All of the exotic animals at the resort were so cool and really made us feel like we were far removed from the winter storm in New York. Some monkeys outside of our room! After an amazing four days at Sandos Playacar I packed my overstuffed suitcases and we were off to our next resort. Our resort for the next three days would now be the Banyan Tree Mayakoba, a very unique type of resort I had heard a lot of great things about. The Banyan Tree is made up exclusively of private villas set in a jungle and beach area which has been carefully constructed to minimize the disruption to the local ecosystem. The Banyan Tree calls itself a “sanctuary for the senses” and this moto 100% rings true from the moment you get there. From the breathtaking lobby to the incredible jungle landscape you feel completely at peace. They personalize your villa with everything of your choice - from the incense scents (I chose lavender and orange) to pool temperature (94 degrees) to food and drinks (I chose guacamole and, of course, mojitos). The villas themselves are breathtaking with a private, pool, hot tub, outdoor bath, and separate living room and kitchen area. You even get own personal bicycles to get around the areas of the resort! Taking a romantic outdoor candle lit bath with champagne ! In addition to the amazing personalized service, the food was just absolutely out of this world. We had dinner at two of their restaurants Cello (Italian) and Saffron (Asian). Saffron was actually some of the best Thai food I’ve had in my life! The chefs are flown in from Thailand and it really shows in the authenticity and flavor of the dishes. Even the more casual restaurants like the poolside restaurant features guacamole that too die for and amazing drinks. At breakfast at the restaurant Orient they had an incredible selection including a breakfast taco station, all overlooking a beautiful river. Our bedroom and walk out pool. What I enjoyed the most about the Banyan Tree Mayakoba is its strong commitment to preserving the natural environment. We took a guided boat eco-tour on the many rivers around the resort area and our tour guide explained all of the careful conservation efforts that were taking place to promote the continued health of the natural environment. The success of their efforts was on display with all of the various fish, birds, and amphibians that were on display everywhere we went, including a sunbathing crocodile! In fact, many species of rare birds have been returning to the area thanks to the Banyan Tree’s efforts to conserve their habitats. Right next to the resort’s beautiful beach they are painstakingly planting coral reefs piece by piece. Because of changing global temperatures and habitat destruction coral reefs are on the sharp decline all across the world. It is so great the Banyan Tree taking strides to fix this terrible problem in our oceans’ ecosystems. Drinking a grapefruit Mimosa while waiting for our Eco Tour boat! The Rooms at the Grand Velas ! After a few incredible days it was time to say a sad goodbye to the Banyan Tree and move on to our final resort. Luckily it was literally next door. Our final resort of our Mexico vacation was the Grand Velas Riviera Maya. This five star all-inclusive resort on the beach was simply paradise! Our suite was enormous and had a huge balcony overlooking the incredible beach and ocean. Our room was also stocked with personal treats like fruit, chocolate, candy, champagne, mezcal, and our own sun hats to wear by the pool. One of the many stunning infinity pools at the Grand Velas ! We swam and drank mojitos all day. Speaking of the pool, WOW does the Grand Velas have incredible pools. Not only are they huge and look amazing, they are heated and feature swim-up bars. Their mojitos were fantastic, and I even tried a few of their other cocktails and they were equally as good. The food by the pool was so fantastic - I really recommend the fish tacos, sushi and tuna salad. In fact, the food everywhere we went way exceeded our expectations even for a resort of this high caliber. The most memorable dining experience we had was at Cocina de Autor, a 10-course extravagant dining experience (at least I think it was ten courses, I lost count it might have honestly been more). I could write a whole blog post about that dinner, but I’ll just leave it at this: this is a must visit if you ever get the chance to visit Grand Velas. And I also feel that I need to mention again that this is an all-inclusive resort so you are getting a 10-course dinner included in your experience! Each course was a small dish ranging from muscle burgers, to foie gras, to quail, grouper with cactus and so much more. Each course not only tasted delicious but was also paired with a specific glass of wine or liqour that would perfectly compliment the course. Also I recommend Piaf, a romantic French restaurant with a live harp player, and Frida, a traditional Mexican restaurant dedicated to matching the vibrancy of famed artist Frida Kahlo with their food. Pro tip for Piaf restaurant: you can order a rose martini and I’m not sure how they make it but it’s really good! Pro tip for Frida restaurant: if you like cheese, definitely get the aged 3 cheese soup you will thank me later, it was to die for !! Dancing around the resort ! One final thing that I think needs to be mentioned about the Grand Velas is the amazing attentiveness of the service. Every time we went somewhere the staff was so helpful. At the pool they brought around sushi and other snacks and the pool attendants knew my name and exactly what drink I like - it’s a mojito in case you haven’t been able to guess that by now! We were even given a personal concierge for our room that made sure everything was as we needed. 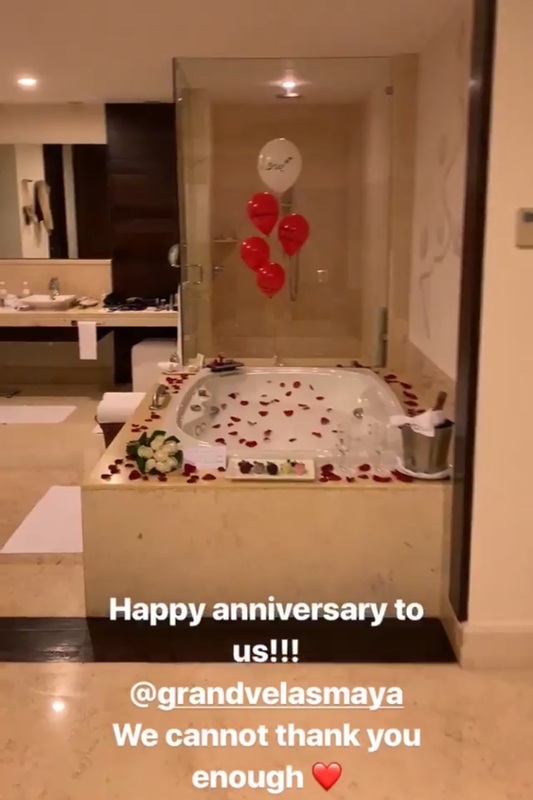 It was actually our anniversary one night at the Grand Velas and while we were out to dinner they snuck into our room and made it super romantic. They drew a bubble bath with rose petals, a bottle of champagne and chocolate strawberries. It was so sweet and clearly took a lot of effort! Coming back from dinner to this sweet surprise meant so much to us. Our incredible personal concierge Jennifer actually stayed late after work to make this all come to life. Everyone at Grand Velas really went above and beyond to make us feel special and loved. Unfortunately soon came our final day in Mexico and it would soon be time to leave for the airport. On the morning of our last day we visited the spa at the Grand Velas which is also the largest spa in Latin America! I got a really amazing and lengthy treatment that I recommend to anyone that needs some muscle relaxation. First I went through a ceremonial water treatment composed of water jet massages, a sauna, steam room, ice room, and finally a clay scrub. After the water ceremony I had an 80 minute Bacal Massage ( corn massage ). The massage started out with a traditional Mexican ritual celebrating the four elements water , wind, earth and fire. I then got a full body exfoliation, showered and had the massage. They not only gave a really relaxing and deep massage but they used hot cobs of corn to help massage and relax my muscles. It was unlike any other massage I have ever had and I was soft as a baby for weeks after my exfoliation! After the morning spa treatment we spent our remaining moments by the pool, ate a few more fish taco’s and unfortunately had to catch our taxi to the airport. On the way back from my amazing massage! Overall it was just an amazing trip all around. We did fortunately luck out and got great weather the entire time we were there. We spoke to some of the resort staff that told us the week before we arrived there was a lot more rain than usual. I’m really glad we got good weather but I know we would have enjoyed ourselves anyway - so long as it wasn’t freezing cold like it is in New York in January! Living in a cold place really makes you appreciate a sunny paradise I guess. Can’t wait to go back to Mexico, but first I have a few other places on my list. Stay tuned for more of my world travels! Me and my love, Michael Schwab. He also is the photographer of all the images from this trip! National Women and Girls in Sports Day ! While getting ready for an in studio dress rehearsal and kept hearing these really cute little giggles. As I looked to where they were coming from two pairs of big bright eyes made eye contact with me and then looked at each other with lots of excitement. These two adorable girls were Sage and Anna. Over the next few months while rehearsing and performing I got to talk to and know Sage and Anna and their precious personalities. They are both aspiring ballerinas and were just so excited that a professional ballet dancer from the company would acknowledge them and talk with them. Little did they know that talking with them made my day! Their joyfulness and passion reminded me of the reasons why I started dancing, their positivity made me optimistic even on the worst of days and watching them grow and improve as dancers every time they came to ballet made me inspired. Getting to be a mentor to them and be a person they can look up to is something that makes me so happy and fulfilled. Im excited to follow Sage and Anna as they continue dancing and I can’t wait to see all of the amazing things they will accomplish in life ! Happy National Women in sports day ! Did you know that girls drop out of sports 2x’s as fast as boys ?! I can’t imagine my life if I had dropped out of ballet. Even if I had not pursued ballet as a career it has helped shape me to become the woman I am today. If you have a sister, a nice, a daughter or even just a younger aspiring female in your sport take a moment to let them know how awesome it is that they follow their dreams and passions. Encourage them to continue their sport, encourage them to push boundaries and most importantly encourage them to be the best versions of themselves! Anna, Sage and I are wearing Athleta. I am wearing Athleta’s Womens Action Mesh Trainer 7/8 Tights in black and thier Hyper focused Support Top in Violet Bluch. The girls are wearing The Athelta Girls Meshin Around Capri Balck and Power Up Teein Purple Flourish Neon Heather. It was really special to wear matching outfits with Sage and Anna. When they came over and I gave them thier outfits Anna almost burst of excitement and exclaimed that this was her new FAVORITE outfit ! The elasticity and stretch of the fabrics allowed us to do all of our ballet movements and they were so comfy even to lounge around it. One of my favorite features was the drawstring on my leggings. It is inside the pants so you cant see them and connected so it wont get lost! This past fall I got a stress fracture in my foot from over use. This may not sound like a big deal but my career relies on me being able to dance. I was placed in a boot and was told to take a couple of weeks off. An injury like this can be a huge set back for dancers and affect their casting for the rest of the season. I felt helpless and if it wasn’t for my best friend Madelyn, I wouldn’t of come back so quickly or so strong. Besides also being an increidble ballet dancer Madelyn is a really beautiful person, inside and out. She saw how upset I was about my injury and wanted to help me in any way she could. She encouraged me to cross train and would go to the gym before and after work to stretch, strengthen and tone. When I was finally able to start slowly dancing again she stayed after in the studio to help me get my strength and stamina back. When I first got injured I wasn’t sure if I would even be able to dance for the rest of the year but thanks to my incredible and amazing friend Madelyn I was back, stronger than ever and danced as a soloist in the opening night of our Nutcracker! Who empowers you? Is there a person in your life who encourages you to be your best, pushes you to reach your goals or someone who helps you overcome obstacles? Can you be that person for someone? Madelyn and I are dressed in Athleta ! I’ve previously mentioned before that I am VERY particular when it comes to the leggings I wear. I like leggings that are tight but breatheable, that have fun color, shape and design, leggings that compliment my figure and most importantly to me, leggings that stay up no matter what exercise I am doing. Here we are wearing Athleta’s new Contender tights and I was overjoyed when I found that they not only checked off ALL of my requirements but also have hidden pockets which made them go to #1 on my legging list! I have worn and washed them multiple times and they have kept their shape, color and elasticity perfectly. The Contender tights come in an array of bright and fun colors that will be sure to empower you to best your best ! If I’m being honest, being a ballerina isn’t the most lucrative career. Almost all of the furniture I own is a hand me down or was purchased off of craigslist. As I am getting older and establishing my home I thought it would be good to start investing in good quality furniture that would last me for years to come. In my search I came across a lot of furniture companies that seemed to all have the same cookie cutter styles and cheap quality. When I came across Teamson’s home decor brand, Versanora, I was delighted to find that their pieces were modern, chic and my favorite part, affordable! Their reviews were great and they had a sale so I figured why not ! I got the Divano Armchair in teal blue and the Artiste Tripod Studio Floor Lamp in black and gold and I eagerly awaited its arrival! They both arrived within the same week that I placed my order and just the legs on both pieces had to be attached. The quality of both the chair and lamp were fantastic and they both were very sturdy. I was worried that the teal blue would stand out too much in my cream colored living room, but instead it became the perfect accent piece. The lamp is a beautiful statement of both modern and antique decor. It tucks perfectly in the corner of my dining room and gives off warm light. I was so excited to get these pieces for my home. During the holidays, it’s common to come across things while shopping for others that you’re just dying to get for yourself, so Versanora encourages you to #GoGiftYourself this holiday season! To make the idea even sweeter, Teamson has just announced a major holiday sale! From now through Dec. 14 select items across all Teamson brands will be on sale on Teamson.com, with price cuts ranging from 15 to 50 percent! PLUS, my unique 20 percent off coupon, TeamsonTBB20, will be valid to use on ALL items, including those that are being marked down, increasing your savings this holiday season! Plus, shipping is free on all orders of $49 or more! And, who doesn’t love extra savings?! Act now because items are already flying off the shelves. Disclaimer: I did receive both pieces of furniature in exchange for a review. Nevertheless the review is my true feelings! These pieces are by far the nicest pieces of furniture I own and I know that I will have them for years to come. It is a rare thing to find me wearing pants. I don’t like feeling confined and especially when I am traveling I like to always be wearing clothes that give me the freedom to move and dance at any moment. On October 9th, 2018 my life was forever changed when I tried on Athleta’s Sculptek denim. I tried two styles, the Sculptek Skinny Jean Carbon Wash and the Sculptek Skinny Crop Jean Biscayne Wash. Both jeans are stylish well made, extremely flattering to my figure and from the moment I put them on I felt extremely comfortable. Other companies have tried to create stretchy jeans or jeggings but I had yet to find a brand that made jeans stretchy enough to allow me to dance freely as well as being flattering and keeping their shape. Therefore I wanted to put them to the ultimate test to see if Athleta could do the impossible. I went into a grande plei, kicked my leg to my face, stretched in all different positions and then finished my test with a split. I was amazed, the jeans were a breeze to move in, they didn’t hold me back in any way and to my delight they kept their shape and tightness. I wore them for the rest of the day while danced around my city as well as while lounging around my house and wore them when I went out at night as well.I got numerous compliments on how they looked and I was just so happy to share my genuine adoration for these jeans.